After much deliberation Keith has decided to make this year’s exhibition the last, but don’t worry, he has no intention of giving up painting and his work will continue to be available direct from him via this website. Although his paintings are seen worldwide, especially in the USA, the exhibition at his home town in Rushden Hall has always been special to him. It all began twenty five years ago when Keith was asked to exhibit his work for two days at Rushden Hall. The exhibition was so successful that the next year it was held for 9 days and in 2005 became the ‘Mayors Memorial Art Exhibition’, the focal point of the ‘Mayors Memorial Week’. 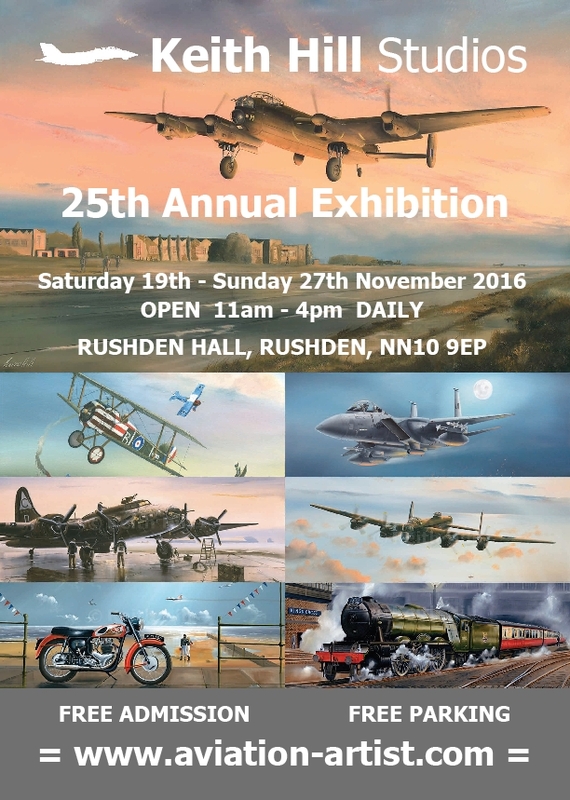 The full range of Keith’s work will be on display in this historic setting, with over one hundred paintings and prints covering his aviation, railway, military and motorbike subjects. The aviation subjects include works from WWI to the present day. Come and see and hear the stories behind the planes, trains, bikes and servicemen of whom the pictures depict. The Exhibition will be formally opened by Rushden Town Mayor Cllr Tracey Smith, in the presence of local WWII Veterans. A new painting will be unveiled during this ceremony. Looking after our veterans and our military guests, will once more be the young people from Rushden Air Training Corps. Outside the Hall, we hope to have Jon Titmuss and Bill Betts with their military vehicles on display. Please contact Keith for more details.